​A visit to Laos is a tonic for the soul. One cannot help but be moved by the vast, karst landscape of Vang Vieng, the architecture of Vientiane, the temples of Luang Prabang and the pervading serenity of the orange-clad Buddhist monks. ​Vientiane and Luang Prabang are served by a variety of regional carriers and can be easily reached from the nearby hub of Bangkok. ​Facilities and amenities in the larger centres are good, and moderate elsewhere. English is widely spoken and there are good bus transport links throughout the country. Despite having two distinct weather seasons you can travel in Laos all year round and with no coastline to influence things, Laos’s weather system is relatively straight-forward compared with much of Asia; consisting of a dry season (October through April) and a wet season (May through September). Temperatures average around 29°C in the lowlands and 23°C in the mountain valleys. 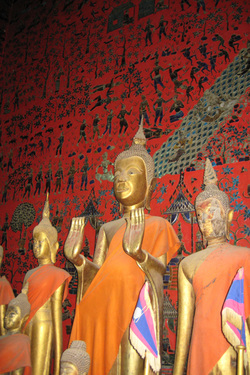 We visited Laos in 2008 with our children aged 4 and 7 and their grandparents aged in their 60s. It is definitely a country we would like to go back to and explore more! ​​Click on the sample itinerary below to view a suggested family holiday for this destination. This is based on our own travels but can be amended to suit differing ages, group sizes and duration. Accurate travel times, accommodation and guide details will be provided once your personalised itinerary is confirmed.